Intermediate bulk containers (also called pallecons, IBCs, pallet boxes, pallet crates or pallet bins) are used for storing and shipping goods from one location to another. The intermediate bulk containers are filled with the goods and are loaded directly onto a transportation vehicle such as truck or a train car and shipped to their destination. Intermediate bulk containers provide protection of shipped and stored goods from damage or breakage and simplify the handling of goods. Intermediate bulk containers also reduce the cost of loading the containers onto pallets in order to move them from one place to another. Presently, there are four types of intermediate bulk containers: Wood bulk containers, Cardboard bulk containers, metal bulk containers and plastic bulk containers. Wood bulk containers were the traditional tool for storage and shipping in the past. Cardboard bulk containers were the lightweight solution for shipment and storage and are limited in their application because they easily fall apart, especially when wet. Metal bulk containers are used for storage and shipping and are limited in their application due to their heavy weight and high shipping costs. Plastic bulk containers (pallet boxes) are an advanced combination of a pallet and a container or a bin. In recent years, Plastic bulk containers (pallet boxes) gained significant market presence and continue to grow. The conversion from wood and corrugated packaging products to plastic reusable and returnable packaging products has brought many world-class companies significant financial and operational benefits and the use of plastic intermediate bulk container increases its application in the freight forwarding and the storage industries. The international trend has shifted towards the use of Plastic bulk containers (pallet boxes). Plastic bulk containers (pallet boxes) are already in use for storage and shipping in a wide range of industries such as: agriculture, automotive, clothing, electronics, food, fruits and vegetables, groceries in supermarket chains, dairy, fisheries, freight forwarding, household goods, nurseries, pharmaceuticals, packaging and logistics. Bulk containers are used for health care, medical and cosmetics, arts, crafts and paint, in schools and day care centres, for hardware, for laboratory research, for musical equipments, for hunting, fishing and outdoor sport storage, and for storage of lubricants, sealants and adhesives. Their uses are diverse and the applications are endless. Today, all companies, up and down the supply chain, are demanding lower costs from each of their suppliers as competition increases. Returnable and reusable transport packaging offers not only reduced costs, but also increased efficiencies over most forms of one-way packaging. Plastic bulk containers (pallet boxes) are used in a wide range of applications. Some items, such as food packaging, become waste only a short time after purchase. The greatest advantage of Plastic bulk containers (pallet boxes) is that they lend themselves to be reused many times over and they save on the cost involved with shipping the container from place to place. The food industry is the main market for intermediate bulk containers. Plastic2go manufactures and distributes Plastic bulk containers (pallet boxes) that are stackable, rackable and folding, roll-out containers and more. In the food industry the need to keep the produce fresh, freeze, ventilate and withstand heat of cooked food with no risk of contamination, makes the plastic bulk container the best solution for the industry. In the food industry, the need to store food for long periods in freezing conditions becomes a necessity that only intermediate bulk containers can handle. Many products are picked in season, processed and frozen for periods of up to 14 month in Plastic bulk containers (pallet boxes) that can stand the freezing conditions and change in temperature, not like the wooden one. All food in supermarket freezers have been stored in cold places and needed a storage product that can handle the cold and not in risk of contamination. Plastic bulk containers (pallet boxes) are used to store from light weight to heavy weight good and it is the most efficient and effective way to move food through all links of the distribution chain. Plastic bulk containers are usually loaded in any segment of the material handling process, and then stored or shipped to new locations. Plastic bulk containers help protect delicate and fragile food products, from each stage of the processing through the warehouse or distribution centre, all the way until they reach the merchant’s shelves. The use of Plastic bulk containers (pallet boxes) provides smooth, protective handling, good stability and excellent ventilation if needed. Many companies around the world dealing with food processing are moving to usage of plastic bulk container over wood containers. The high hygiene standards essential in the food industry can be easily attained using intermediate bulk containers. Wood containers are subject to fungi and presence of water and moist increases their vulnerability to bacteria and risk wastage of food. Plastic bulk containers (pallet boxes) reduce quarantine costs. In some countries around the world every container entering the country containing wood needs to go through quarantine. Wood intermediate bulk containers need to be fumigated to ensure that fungi, bacteria and small insects residing in the wood do not enter the country. Australia and NZ are very strict in their quarantine procedures. Wooden pallets need to be separated from the load and fumigated and if the product is inside a wood container the whole container will require fumigation. In many industries, like the food industry, the process is costly, time consuming and might damage the goods. In the food industry, returnable Plastic bulk containers (pallet boxes), which are rigid for outbound trips and folding for inbound trips, are now being used to transport all types of produce between manufacturers and supermarkets all over the world. With its special suitable heavy load pallet moulded to the bottom, this bulk container does not need to be reloaded onto a pallet. The pallet attached to the container makes the intermediate bulk containers creates uniformity and makes it a stable and more efficient unit load. Reusing a plastic bulk container is preferable to recycling as it uses less energy and fewer resources. Long life, multi-trip plastics packaging has become more widespread in recent years, replacing less durable and single-trip alternatives, so reducing waste. For example, in the UK alone, the major supermarkets have increased their use of returnable plastic crates and containers and the use is increasing every day. Plastic bulk containers (pallet boxes) last up to 20 years and can be recycled at the end of their useful life. Reduced packaging waste is not the only benefit of using plastic bulk containers instead of corrugated boxes or wooden bulk containers for produce. Better protection and reduced chilling time means more produce gets to its destination quicker and fresher than ever before. Sturdier transport packaging means fewer collapsed loads due to moisture-saturated cardboard. The use of Plastic bulk containers (pallet boxes) is efficient in reducing warehouse space because containers can be stacked or folded on top of each other without fear of damaging precious unit loads. Standard wooden bulk containers are used for all products that are not sensitive to weather or water. They cannot be used for dairy, health, beauty aids, automated meat systems or frozen food storage. Plastic bulk containers (pallet boxes) are more suitable for use in the food industry because of their ability to stand water or bad weather and be in automated systems or frozen storage. Plastic bulk containers (pallet boxes), used in distribution and storage industries are an advanced reproduction of the traditional wooden bulk container. The use of plastic bulk container has also increased because of awareness of global warming. Their reusable quality and recycling possibility, makes them the best option in the market today. The wine industry is one of the big divisions of the food industry that need to keep their produce fresh. Plastic bulk containers (pallet boxes) are used to store grapes or liquid and are the most efficient and effective way to move them through all links of winery process. Plastic bulk containers are usually loaded in any segment of the winery process, and then stored or shipped to new locations. Many companies around the world dealing with food processing are moving to the usage of intermediate bulk container over wood containers. They high hygiene standards essential in the winery industry can be easily attained using intermediate bulk container. Wood containers are subject to fungi and presence of water and moisture increase their vulnerability to bacteria presence, damage the quality of the wine and risk the wastage of the food. In the wine industry, returnable Plastic bulk containers (pallet boxes), which are rigid for outbound trips and folding for inbound trips, are now being used to transport all types of products through packaging to supermarkets all over the world. With its special heavy load pallet moulded to the bottom, this bulk container does not need to be reloaded onto a pallet. The pallet attached to the container makes the intermediate bulk container stable and thus a more efficient loading unit. Plastic bulk containers (pallet boxes) are suitable in any automated food processing facility because they are uniform in shape and can stand water and moisture. Reusing a plastic bulk container is preferable to recycling as it uses less energy and fewer resources. Long life, multi-trip plastic packaging has become more widespread in recent years, replacing less durable and single-trip alternatives, therefore reducing waste. Plastic bulk containers (pallet boxes) last up to 20 years and can be recycled when no longer in use. Reduced packaging waste is not the only benefit of using plastic bulk containers instead of corrugated boxes or wooden bulk containers for produce. Better protection and reduced chilling time means more produce gets to its destination faster and fresher than ever before. Sturdier transport packaging means fewer collapsed loads from moisture-saturated cardboard. The use of Plastic bulk containers (pallet boxes) is efficient in reducing warehouse space because they can be stacked or folded one on top of the other without fear of damaging their unit loads. Plastic bulk containers (pallet boxes) are more suitable for use in the wine industry because of their ability to stand water or bad weather and be in automated systems or frozen storage. 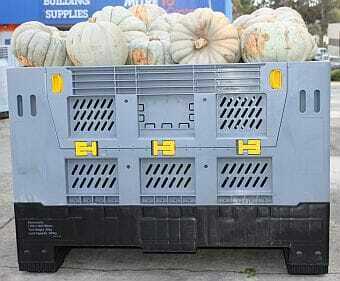 The fruits and vegetable industry is extending its use in Plastic bulk containers (pallet boxes). Millions of metric tons of fresh fruit and vegetables travel the roads of the world every day. Using Plastic bulk containers (pallet boxes) is the one of the most efficient methods of transporting them through all links of the distribution chain. Plastic bulk containers (pallet boxes) typically travel through three segments of the fruits and vegetable industry. The field, the packaging and the distribution to retail store. Wooden bulk containers are still popular amongst personnel in the fruits and vegetable industry, but the need to have a high competitive edge leads farmers to look for better alternatives. Plastic bulk containers (pallet boxes) are much easier to handle than wooden bulk containers. Plastic bulk containers (pallet boxes) support careful handling because of their smooth surface unlike the nails and splinters in wooden containers. Plastic bulk containers (pallet boxes) save quarantine costs and procedures and are reusable when they are no longer required. Circulation is necessary in the fruit and vegetable industry. In a vented plastic intermediate bulk container, the product can live longer, thus enhancing the quality of produce, ensuring fresh delivery to markets. Plastic bulk containers (pallet boxes) are produced by injected-moulding methods. The plastic bulk containers are identical to each other and their uniformity is cost effective in stacking on valuable floor space in a factory, in storage space or in transportation vehicles. Some Plastic bulk containers (pallet boxes) can be easily folded to achieve significant saving of valuable space and shipping costs. In the fruits and vegetable industry, sometimes the pick is loaded into the container and, stays there. The appearance of the Plastic bulk containers (pallet boxes) are also very attractive and encourage purchases right out of the bulk container. They are also cost effective in saving distributing the good into shelves. The innovative use of folding Plastic bulk containers (pallet boxes) helps stores compact containers when not in use. The containers easily open when needed. The folding plastic intermediate bulk container is durable, lightweight, solid and allows air circulation if needed. The folding plastic intermediate bulk container has a pallet built into the bin or container and is easily manoeuvred by machinery. The Plastic bulk containers (pallet boxes) are easy to clean with high pressure and washed with water while the wooden containers are subject to bacteria and fungus in the presence of water. They are also damaged by moisture and change their strength and shape in the presence of water. Metal intermediate bulk containers are also sensitive to water and are subject to corrosion in the presence of water. 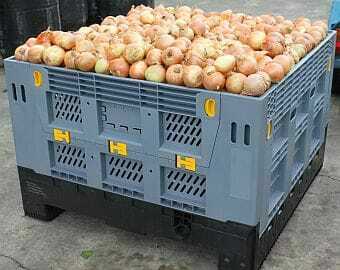 This makes the Plastic bulk containers (pallet boxes) more suitable to the fruits and vegetable industry. Plastic bulk containers (pallet boxes) are strong enough to handle heavy loads of fruits and vegetables and are cost effective in shifting the good from one container to another. The pallet is moulded together with the container and significantly contributes to easy manoeuvring of the bulk container. Plastic bulk containers (pallet boxes) provide better compatibility with automated machinery, than wooden or metal containers that cannot withstand moisture and different temperatures. Plastic bulk containers (pallet boxes) can also be stored in open areas. Sun and rain do not damage them as it would wooden or metal bulk containers. Plastic bulk containers (pallet boxes) can be easily cleaned and returned to the distribution network. Wooden bulk containers contaminated with bacteria and fungus need to be disposed. This makes them less cost effective than plastic bulk containers. Plastic bulk containers (pallet boxes) have high UV resistant, unlike wooden bulk containers and metal bulk containers that are sensitive to climate and changes in temperature. Many fruit and vegetable companies prefer the use of Plastic bulk containers (pallet boxes) because of their ability to stand freezing conditions while the wooden bulk containers are damaged when frozen. This allows the produce to be shipped in the plastic bulk container directly into freezers without the need to move them to separate containers suitable for freezing. Furthermore, Plastic bulk containers (pallet boxes) eliminate the need to load produce onto pallets as it can be shipped in the plastic bulk containers. The use of the intermediate bulk containers requires machinery due to load weight. In the fruit and vegetable industry, there is a high demand of machinery usage to handle medium to heavy weight loads. Handling medium to heavy loads by personnel creates a safety hazard and increase insurance cost due to back injuries and injuries caused by nails and splinters. This makes the plastic intermediate bulk container better than the wooden bulk container that lacks the durability and creates a safety hazards to personal and products. Reusability of Plastic bulk containers (pallet boxes) minimises purchasing costs. The life span of a plastic bulk container is 15 times longer than its wooden alternative. Empty plastic containers are stackable, folding and can be dismantled, which means they occupy less space and reduce shipping weight, providing savings in return distribution. Returnable Plastic bulk containers (pallet boxes) offer: real packaging, material cost savings, more efficient unit loads, better use of warehouse space, increase profit and improved customer satisfaction along the supply chain. Reuse of Plastic bulk containers (pallet boxes), contributes to prevention of global warming by reducing the use of trees for wooden containers. Recyclable Plastic bulk containers (pallet boxes) can eliminate disposal costs that are constantly growing, especially in countries with limited resources. The use of plastic bulk containers increases wood resource in any country for the effective use of the wood. Plastic2go manufacture and distribute plastic and storage intermediate bulk containers stackable, rackable, and folding, roll-out containers and more. The use of Plastic bulk containers (pallet boxes) is the most efficient and effective way of getting your products to market. Plastic bulk containers (pallet boxes) are used to store medium to heavy weight goods and move them through all the links of the distribution chain. Plastic bulk containers are usually loaded in the first segment of the material handling process, and then stored or shipped to new locations. Plastic bulk containers help protect delicate and fragile products, like produce, from the field through the warehouse or distribution centre, up until they reach the merchant’s shelves. Plastic bulk containers (pallet boxes) save quarantine cost. In some countries around the world every container entering the country containing wood needs to go through a quarantine procedure. If products shipped in a wooden intermediate bulk container, the container needs to be fumigated to ensure that fungi, bacteria and small insects residing in the wood do not enter the country. Australia and NZ are very strict in their quarantine procedure. Wooden pallets need to be separated from the load and fumigated and if the product is inside a wood container, the whole container will require fumigation. In many industries, like the grocery industry, the process is costly, time consuming and might damage the goods. In the grocery industry, returnable Plastic bulk containers (pallet boxes), which are rigid for outbound trips and folding for inbound trips, are now being used to transport all types of produce between growers and supermarkets all over the world. With its special heavy load pallet moulded to the bottom, these bulk containers do not need to be reloaded onto a pallet. The pallet attached to the container makes the container more stable and efficient in unit loading. Reusing a plastic intermediate bulk container is preferable to recycling as it uses less energy and fewer resources. Long life, multi-trip plastics packaging has become more widespread in recent years, replacing less durable and single-trip alternatives, so reducing waste. For example, in the UK alone, the major supermarkets have increased their use of returnable plastic crates and containers and the use is increasing every day. Plastic bulk containers (pallet boxes) last up to 20 years and can be recycled when they are no longer in used. Reduced packaging waste is not the only benefit of using plastic bulk containers instead of corrugated boxes or wooden bulk containers for produce. Better protection and reduced chilling time means more produce gets to market quicker and fresher than ever before. Sturdier transport packaging means fewer collapsed loads from moisture-saturated cardboard. The use of Plastic bulk containers (pallet boxes) is efficient in reducing warehouse space because they can be stacked or folded one on top of the other without fear of damaging their unit loads. Standard wooden bulk containers are used for all grocery products that are not sensitive to weather or water. They cannot be used for dairy, health, beauty aids, automated meat systems or frozen food storage. The dairy industry is one of the heaviest users of Plastic bulk containers (pallet boxes). Plastic dairy intermediate bulk containers are strong and resilient made from high-density polyethylene, which stands up to the challenges of the industry. Cardboard boxes and wooden bulk containers are somewhat lacking in the qualities necessary for the dairy industry. Custom-made plastic bulk containers can be used from the first to the final stages of the material handling process, from the farmers to the display on supermarket shelves and then to the customer and finally, their kitchen, as has already been proven in some countries. Dairy Plastic bulk containers (pallet boxes) are strong enough to handle the process that the handling and shipping of dairy products entails. Cardboard is light and subject to damage if fitted with a heavy load. Plastic bulk containers (pallet boxes) can handle automated stacking equipment, high-pressure washing, sterilization and big temperature changes from warehouse to refrigeration. Wooden bulk containers or cardboard cannot meet these requirements because they are sensitive to washing, cannot be incorporated into the processing line and are sensitive to temperature changes. Plastic bulk containers (pallet boxes) in the dairy industry are able to handle heavy loads and the rigors of loading, stacking and transportation. Plastic bulk containers (pallet boxes) have smooth surfaces prevent damage to contents. They eliminate dirt traps and makes cleaning easy regardless of size. The innovative use of folding Plastic bulk containers (pallet boxes) means they can be stored compactly when not in use and easily popped open when needed. The folding plastic intermediate bulk container is durable, lightweight, solid and can allow air circulation if needed. The use of plastic intermediate bulk container is cost effective as it eliminates the purchase of pallets and the need to shift the load onto a pallet in order to move from place to place in the distribution chain. Plastic bulk containers (pallet boxes) save quarantine cost. In some countries around the world every container entering the country containing wood needs to go through quarantine procedures. If product are shipped in a wooden intermediate bulk container, the container needs to be fumigated to ensure that fungi, bacteria and small insects residing in the wood do not enter the country. Australia and NZ are very strict in their quarantine procedure. Wooden pallets need to be separated from the load and fumigated and if the product is inside a wood container, the whole container will require fumigation. In many industries, like the dairy industry, the process is costly, time consuming and might damage the goods. Reuse of Plastic bulk containers (pallet boxes) is cost effective as it eliminates the endless purchases of cardboard or wooden container. Reuse of plastic bulk containers contributes to prevention of global warming by reducing the use of trees for wooden containers or cardboard. Recyclable plastic bulk containers eliminate disposal costs that are constantly growing, especially in countries with limited resources. The use of plastic bulk containers, increases wood resource in any country for the effective use of the wood. Plastic bulk containers (pallet boxes) find increasing acceptance in the agriculture industry. Plastic bulk containers are strong enough to handle heavy loads of dirt and plants unlike cardboard. Plastic intermediate bulk container provides better compatibility with automated nurseries, than wooden bulk containers, metal bulk containers or cardboard that cannot withstand moisture and different temperatures. Plastic bulk containers (pallet boxes) can be easily stacked to achieve significant saving of valuable nursery space and shipping costs. Plastic bulk containers (pallet boxes) can also be stored in open areas. Sun and rain do not damage them as they would do wooden, metal or cardboard containers. Plastic bulk containers (pallet boxes) are resistant to bacteria and fungi, both of which grow on wooden, metal products and cardboard. Plastic intermediate bulk container can be easily cleaned and returned to the distribution network. cardboard cannot be reused and must be disposed. Wooden containers contaminated with bacteria and fungus needs to be disposed. This makes them less cost effective than plastic containers. Increasing safety and sanitary requirements for the agriculture industry further encourage use of plastic bulk containers. Plastic bulk containers (pallet boxes) have high UV resistance, unlike cardboard and wooden bulk containers. Which makes them cost effective because the can be stored outside to save storage space. On the appearance side, unlike wooden bulk containers that have nails and splinters that will damage goods, the Plastic bulk containers (pallet boxes) have smooth surfaces which are easy to clean and do not have rough edges that can tear packaging. The appearance of the plastic bulk container is also very attractive due to the wide colour range and embossed company logos which encourage purchases right out of the container. The innovative use of folding plastic bulk container helps store containers compactly when not in use. Containers can be easily opened when needed. The folding plastic intermediate bulk container is durable, lightweight, solid and can allow air circulation if needed. Reuse of Plastic bulk containers (pallet boxes) is effective in purchasing costs. It eliminates endless purchases of cardboard or wood. Reuse of Plastic bulk containers (pallet boxes), contributes to prevention of global warming by reducing the use of trees for wooden bulk containers or the making of cardboard boxes. The use of the Plastic bulk containers (pallet boxes) requires use of machinery. The pallet attached to the container allows for easy manoeuvring which is cost effective. These qualities make the Plastic bulk containers (pallet boxes) superior to the wooden bulk containers as they create a safety hazard to personnel handling the container due to nails, splinters or injuries caused by improper lifting of to heavy containers. Recyclable Plastic bulk containers (pallet boxes) can eliminate disposal costs that are constantly growing, especially in countries with limited resources. The use of plastic bulk containers, increases wood resource in any country. The fishery industry is extending its use in Plastic bulk containers (pallet boxes). The catch is transferred to plastic bulk containers at the docks and then brought to the company’s holding tank, where they are processed. Seafood processors and wholesalers are “buying into” returnable plastic bulk containers and are reaping the benefits with this new distribution mode for the industry. Wooden containers have a long history of use within the fishing industry, but since 2000, its use is declining and clearing the stage for plastic-made crates and intermediate bulk containers. Plastic bulk containers (pallet boxes) are much easier to handle than wooden containers. Plastic bulk containers support careful handling because of smooth surfaces, unlike the nails and splinters in wooden containers. Plastic bulk containers (pallet boxes) are easier to open and close than wooden bulk containers that are not accurate in craftsmanship. The catch needs to stay in water. Plastic intermediate bulk container are the only product that can hold water without loosing it, unlike cardboard that is not able to hold water and wood that is not water resistant. When full, Plastic bulk containers (pallet boxes) weigh much less than full wooden bulk containers that are not fully sealed and therefore much more expensive than plastic bulk container. Circulation is necessary in the fishing industry so that the product can live longer. A plastic intermediate bulk container enhances fresh delivery to the market. Plastic bulk containers (pallet boxes) are produced by injected-moulding methods. The plastic bulk containers are identical to each other and their uniformity is cost effective in saving valuable space on a boat or a ship. Plastic intermediate bulk container can be easily stacked to achieve significant saving of valuable space and shipping costs. In the fishing process, once a catch is loaded into the bulk container, it stays there. The Plastic bulk containers (pallet boxes) don’t absorb water like wood, thus they have a longer life span. The wooden intermediate bulk containers are sensitive to water and long exposure to water changes their durability, shape and strength. Plastic bulk containers (pallet boxes) provide better compatibility with automated machinery than wooden bulk container or cardboard that cannot withstand the moisture and different temperatures. Plastic intermediate bulk container can also be stored in open areas. Sun and rain do not damage them as they would wooden bulk container or cardboard. Plastic intermediate bulk container can be easily cleaned and returned to the distribution network. Wooden bulk container contaminated with bacteria and fungus needs to be disposed. This makes them less cost effective than plastic containers. Increasing safety and sanitary requirements for the fishing industry for handling food further encourage the use of Plastic bulk containers (pallet boxes) over wooden ones. The number of arm and back injuries has been reduced substantially with the change to Plastic bulk containers (pallet boxes). The intermediate bulk containers have the pallet attached and therefore minimise the use of personnel to lift and handle the fish. Plastic bulk containers (pallet boxes) have high UV resistant, unlike wooden containers that are sensitive to temperature changes. Many fishing companies prefer the use of plastic bulk containers because of their ability to stand freezing conditions while the wooden containers are damaged by the extreme freezing conditions. This allows the catch to be shipped in the plastic bulk containers direct into freezers without the need to reload them onto separate containers suitable for freezing. The appearance of the Plastic bulk containers (pallet boxes) is also very attractive and encourages purchases right out of the container. They are cost effective in saving distributing the goods into shelves. The innovative use of folding plastic intermediate bulk container helps store containers compactly when not in use. Containers are easily opened when needed. The folding plastic bulk container is durable, lightweight, solid and can allows air circulation if needed. The folding plastic container has a pallet attached to the bottom and is easily manoeuvred by pallet jacks or forklifts. Reuse of plastic intermediate bulk container is cost effective in purchasing costs. It eliminates endless purchases of cardboard that have very short life spans in the fishing industry and the need to buy wooden container. Although wooden containers have a longer life span than cardboard, they are still usable 15 times less than plastic bulk containers. The empty plastic bulk container are stacked, which means they occupy less space and reduce shipping weight, providing savings in return distribution. Reuse of Plastic bulk containers (pallet boxes) contributes to the prevention of global warming by reducing the use of trees for wood or the making of cardboard. Recyclable Plastic bulk containers (pallet boxes) can eliminate disposal costs that are constantly growing, especially in countries with limited resources. The use of Plastic bulk containers (pallet boxes), increases wood resource in any country for the effective use of the wood. The beverage industry is extending its use in Plastic bulk containers (pallet boxes). Using Plastic bulk containers (pallet boxes) is one of the most efficient methods of transporting injection-moulding tubes into the manufacturing of the plastic beverage product line through all links of the distribution chain. Plastic bulk containers (pallet boxes) typically travel through three segments of the beverage production: Injection-moulding tubes loaded loosely onto the intermediate bulk container and shifted directly with a forklift into the blowing section where the plastic bottle is formed and than filled with the beverage. The use of wooden bulk containers has decreased in popularity amongst personnel in the beverage industry, the need to have a high competitive edge makes personnel look for better alternatives. Plastic bulk containers (pallet boxes) are much easier to handle than wooden bulk containers. Plastic bulk containers (pallet boxes) support careful handling thanks to their smooth surface, unlike the nails and splinters in wooden containers that risk the damage to the thin plastic bottle. Plastic containers also save on quarantine-related costs and hassles and are reusable. The folding plastic intermediate bulk container has a pallet built into it and is easily manoeuvred by pallet jacks or forklifts. The Plastic bulk containers (pallet boxes) are easy to clean with high pressure or water while the wooden containers are subject to bacteria and fungus in the present of water. They are also damaged by moisture and are changed in strength and shape in the presence of water. Metal intermediate bulk containers are also sensitive to water and are subject to corrosion in the presence of water. This makes the Plastic bulk containers (pallet boxes) more suitable to the beverage industry. Plastic bulk containers (pallet boxes) are strong enough to handle heavy loads if necessary and are cost effective in shifting the goods from one container to another. The pallet is moulded together with the container and significantly contributes to easy manoeuvring of the bulk container. Plastic bulk containers (pallet boxes) provide better compatibility with automated machinery, than wooden containers that cannot withstand the moisture and different temperatures. Plastic bulk containers (pallet boxes) can also be stored in open areas. Sun and rain do not damage them as they would wooden bulk containers. Plastic bulk containers (pallet boxes) can be easily cleaned and returned to the distribution network. Wooden bulk containers contaminated with bacteria and fungus needs to be disposed. This makes them less cost effective than plastic bulk containers. Increasing safety and sanitary requirements for the beverage industry further encourage the use of plastic bulk containers over wooden bulk containers. The change to using Plastic bulk containers (pallet boxes) over wooden bulk containers lowers insurance cost for goods and reduces cost associated with the need to shift goods along the supply chain. Plastic bulk containers (pallet boxes) have high UV resistant, unlike wooden bulk containers and metal bulk containers that are sensitive to weather and changes in temperature. Many manufacturing companies prefer the use of Plastic bulk containers (pallet boxes) because of their ability to stand freezing conditions while the wooden bulk containers are damaged when frozen. This allows liquid to be shipped in plastic bulk containers directly into freezers without the need to move them to separate container suitable for freezing. Furthermore, the containers are shipped directly without the need to be loaded onto a pallet. Plastic bulk containers (pallet boxes) save quarantine costs. In some countries around the world any container entering the country containing wood needs to go through quarantine procedures. Products shipped in a wooden intermediate bulk containers need to be fumigated to ensure that fungi, bacteria and small insects residing in the wood do not enter the country. Australia and NZ are very strict in their quarantine procedure. Wooden pallets need to be separated from the load and fumigated and if the product is inside a wood container the whole container will require fumigation. In many industries, like the beverage industry, the process is costly, time consuming and might damage the goods. The use of the intermediate bulk containers requires machinery due to load weight. In the beverage industry there is a high demand of using machinery to handle medium to heavy weight loads. Handling medium to heavy loads by personnel creates a safety hazard and increase insurance cost due to back injuries and injuries caused by nails and splinters. This makes the plastic intermediate bulk container better than the wood bulk container that lacks the durability and creates a safety hazard to personnel handling the container or to products damaged by nails or splinters. 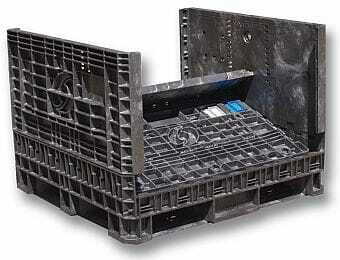 The reuse of Plastic bulk containers (pallet boxes) is cost effective in purchasing costs. The life span of a plastic bulk container is 20 times higher than its wood alternative. The empty plastic containers are stackable, folding and can be dismantled, which means they occupy less space and reduce shipping weight, providing savings in return distribution. The reuse of Plastic bulk containers (pallet boxes), contributes to prevention of global warming by reducing the use of trees for wooden containers. Recyclable Plastic bulk containers (pallet boxes) can eliminate disposal costs that are constantly growing, especially in countries with limited resources. The use of plastic bulk containers, increases wood resource in any country for the effective use of the wood. The garment industry is a big market for Plastic bulk containers (pallet boxes). Millions of metric fabric travels the roads of the world every day. Using Plastic bulk containers (pallet boxes) is one of the most efficient methods of transporting them through all links of the distribution chain. Plastic bulk containers (pallet boxes) typically travel through four segments of the garment industry. From cutting, sewing and packaging through to the distribution centres. Wooden bulk containers no longer have popularity in the garment industry, the need to have a high competitive edge makes companies look for better alternatives. Plastic bulk containers (pallet boxes) are much easier to handle than wooden bulk containers. Plastic bulk containers (pallet boxes) support careful handling because of smooth surfaces unlike the nails and splinters in wooden containers. This factor is essential in the garment industry and the use of wooden intermediate bulk containers risk damaging the garments and causes waste. Plastic bulk containers (pallet boxes) save quarantine cost. In some countries around the world every container entering the country containing wood needs to go through a quarantine procedure. If a product is shipped in a wood intermediate bulk container, the container needs to be fumigated to ensure that fungi, bacteria and small insects residing in the wood do not enter the country. Australia and NZ are very strict in their quarantine procedure. Wooden pallets need to be separated from the load and fumigated and if the product is inside a wood container the whole container will require fumigation. In many industries, like the garment industry, the process is costly, time consuming and might damage the goods. With fabrics, there is a need for a container that is not sensitive to moisture. Unlike the wood container that absorbs moist from the air, the plastic bulk container can support keeping the fabric in controlled conditions from manufacturer through the manufacturing process all the way to retail stores. The innovative use of folding Plastic bulk containers (pallet boxes) helps store containers compactly when not in use. Containers are easily opened when needed. The folding intermediate bulk plastic container is durable, lightweight, solid and can allows air circulation if needed. The folding plastic intermediate bulk container has a pallet built into it and is easily manoeuvred by machinery. The Plastic bulk containers (pallet boxes) are easy to clean with high pressure or water while the wooden bulk container are subject to bacteria and fungus in the presence of water. They are also damaged by moisture and change their strength and shape in the presence of water. This makes the Plastic bulk containers (pallet boxes) more suitable for the garment industry. Although in the garment industry there is not much need for strength, the Plastic bulk containers (pallet boxes) are strong enough to handle heavy loads if necessary. They are cost effective when there is a need to shift the goods from one container to another. The pallet is moulded together with the container and significantly contributes to easy manoeuvring of the bulk container. Plastic bulk containers (pallet boxes) provide better compatibility with automated machinery, than wooden containers that are not accurate and uniform in size and cannot withstand moisture or different temperatures. Plastic bulk containers (pallet boxes) can be easily cleaned and returned to the distribution network. Wooden bulk containers contaminated with bacteria and fungus needs to be disposed because of risk to garments. This makes them less cost effective than plastic bulk containers. Plastic bulk containers (pallet boxes) have high UV resistant, unlike wooden bulk containers that are sensitive to weather and changes in temperature. This increases the plastic bulk container’s life span significantly. The use of the intermediate bulk containers requires machinery due to weight load. In the garment industry there is a shift to using machinery to obtain a competitive edge. In the garment industry there is a high demand of using machinery to handle medium to heavy weight loads. Handling medium to heavy loads by personnel creates a safety hazard and increase insurance costs due to back injuries and injuries caused by nails and splinters. This makes the plastic intermediate bulk container better than the wood bulk container that is lack the durability and creates a safety hazard to personnel handling the container or to products damaged by nails or splinters. The empty plastic containers are stackable, folding and can be dismantle, which means they occupy less space and reduce shipping weight, providing savings in return distribution. Returnable Plastic bulk containers (pallet boxes) offer: real packaging, material cost savings, more efficient unit loads, better use of precious warehouse space, increase profit and improve customer satisfaction all along the supply chain. The use of Plastic bulk containers (pallet boxes) is increasing in the automotive industry. The need to have a high competitive edge makes companies look for better alternatives. Plastic bulk containers (pallet boxes) are much easier to handle than wooden bulk containers. Plastic bulk containers (pallet boxes) support careful handling because of smooth surface unlike the nails and splinters in wooden containers. This factor is important in the automotive industry and the use of wooden intermediate bulk containers risks damaging small part and causes waste. Plastic bulk containers (pallet boxes) save quarantine cost. In some countries around the world every container entering the country containing wood needs to go through a quarantine procedure. If a product is shipped in a wooden intermediate bulk container, the container needs to be fumigated to ensure that fungi, bacteria and small insects residing in the wood do not enter the country. Australia and NZ are very strict in their quarantine procedure. Wooden pallets need to be separated from the load and fumigated and if the product is inside a wood container the whole container will require fumigation. Quarantine procedures increase expenses. The process is costly, time consuming and might damage the goods. Plastic bulk containers (pallet boxes) are produced by injected-moulding methods. The plastic bulk containers are identical to each other and their uniformity is cost effective in stacking on valuable floor space in factories, in storage space or in transportation vehicles that are valuable in the automotive industry. Some Plastic bulk containers (pallet boxes) can be easily folded to achieve significant saving of valuable space and shipping costs.The innovative use of folding Plastic bulk containers (pallet boxes) helps store containers compactly when not in use. Containers are easily opened when needed. The folding intermediate bulk plastic container is durable, lightweight, solid and can allows air circulation if needed. The folding plastic intermediate bulk container has a pallet built into it and is easily manoeuvred by machinery. The Plastic bulk containers (pallet boxes) are easy to clean with high pressure or water while the wooden containers are subject to bacteria and fungus in the presence of water. They are also damaged by moisture and change their strength and shape in the presence of water. This makes the Plastic bulk containers (pallet boxes) more suitable to the automotive industry. 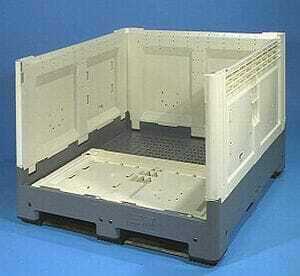 Plastic bulk containers (pallet boxes) are strong enough to handle heavy load of parts for the automotive industry. They are cost effective in shifting the good from one container to another. The pallet is moulded together with the container. This significantly contributes to easy manoeuvring of the bulk container by pallet jacks or forklifts. Plastic bulk containers (pallet boxes) provide better compatibility with automated machinery that is highly used in the automotive industry. Unlike wooden containers that cannot withstand moisture and different temperatures. The change to using Plastic bulk containers (pallet boxes) over wooden bulk containers lowers insurance cost for goods and reduces cost associated with the need to shift goods all along the supply chain. Plastic bulk containers (pallet boxes) have high UV resistant, unlike wooden bulk containers that are sensitive to weather and changes in temperature. Many companies prefer the use of Plastic bulk containers (pallet boxes) because of their ability to stand freezing conditions while the wooden bulk containers are damaged when frozen. This allows the automotive parts that need cooling; to be shipped in the plastic bulk container directly chilled conditions without the need to move them to separate containers suitable for cooling. Therefore, the containers are shipped directly without the need to be loaded onto a pallet. The use of the intermediate bulk containers requires machinery due to load weight. In the automotive industry, there is a high demand for using machinery to handle medium to heavy weight loads. Handling medium to heavy loads by personnel creates a safety hazard and increase insurance costs due to back injuries and injuries caused by nails and splinters. This makes the plastic intermediate bulk container better than the wood bulk container that lacks the durability and creates a safety hazard to personnel handling the container or to products damaged by nails or splinters. In the railway industry, like the automotive industry, there is a big demand for Plastic bulk containers (pallet boxes). Large quantities of intermediate bulk containers are shifted on trains from one place to another all around the world. Using Plastic bulk containers (pallet boxes) is one of the most efficient methods of transporting them through all links of the railway industry. The use of Plastic intermediate bulk container increased in the railway industry. Competition in this industry is increasing, and managers are looking for better alternatives that are efficient, safe and cost effective. Plastic bulk containers (pallet boxes) are much easier to handle than wooden bulk containers. Plastic bulk containers (pallet boxes) supports careful handling because of smooth surface not like the nails and splinters in wooden containers. This factor is important in the railway industry as with the use of wooden intermediate bulk containers, the risk increases and the damage for the small part causes waste. Plastic bulk containers (pallet boxes) save quarantine cost. In some countries around the world every container entering the country containing wood needs to go through a quarantine procedure. If product shipped in a wood intermediate bulk container, the container needs to be fumigated to ensure that fungi, bacteria and small insects residing in the wood do not enter the country. Wooden pallets need to be separated from the load and fumigated. If the product is inside a wood container, the whole container will require fumigation. In many industries, like the railway industry, the process is costly, time consuming and might damage the goods. Plastic bulk containers (pallet boxes) are produced by injected-moulding methods. The plastic bulk containers are identical to each other and their uniformity is cost effective in stacking on a valuable floor space on a train. Some Plastic bulk containers (pallet boxes) can be easily folded to achieve significant saving of valuable space and shipping costs. The railway industry is encouraging its customers to shift to plastic bulk containers to allow them cost effective shipping cost. The innovative use of folding Plastic bulk containers (pallet boxes) helps Stores compactly when not in use and easily pops open when needed. The folding intermediate bulk plastic container is durable, lightweight, solid and can allows air circulation if needed. The folding plastic intermediate bulk container has a pallet built in the bin or the container and is easily manoeuvred by machinery. The Plastic bulk containers (pallet boxes) are easy to clean with high pressure or washed with water while the wooden containers are subject to bacteria and fungus in present of water. The wood container is damaged by moist and change its strength and shape in presence of water. This makes the Plastic bulk containers (pallet boxes) more suitable to be shipped by train. Plastic bulk containers (pallet boxes) are strong enough to handle heavy load of parts for the railway industry. They are cost effective and save the cost associated with shifting the good from one container to another. The pallet is moulded together with the container and it significantly contributes to easy manoeuvring of the bulk container by pallet jack or forklift. Plastic bulk containers (pallet boxes) can also be stored in open areas. Sun and rain do not damage them as it would to wooden bulk containers. Increasing demand for safety encourage use of plastic bulk containers over wooden bulk containers. The switch to using Plastic bulk containers (pallet boxes) over wooden bulk containers lowers insurance cost for goods and also reduces cost associated with the need to shift goods from one transportation vehicle to the other. Plastic bulk containers (pallet boxes) have high UV resistant, not like wooden bulk containers that is sensitive to weather and changes in temperature. The use of the intermediate bulk containers requires machinery due to weight load. In the railway industry, there is a high demand of using machinery to handle Medium to heavy weight loads. Handling medium to heavy loads by personal creates a safety hazard and increase insurance cost due to back injuries and injuries caused by nails and splinters. This makes the plastic intermediate bulk container better than the wood bulk container that is lack the durability and creates a safety hazard to personal handling the container or to product damaged by nails or splinters. Reuse of Plastic bulk containers (pallet boxes) is cost effective in purchasing costs. Life span of a plastic bulk container is 20 times higher than its wood alternative. Returnable Plastic bulk containers (pallet boxes) offer: real packaging material cost savings, more efficient unit loads, better use of precious warehouse space, increase profit and improve customer satisfaction all along the supply chain. Plastic2go helps world-class companies move their products faster, better, safer and more cost-effectively. Plastic reusable bulk containers, improves the flow of product all along the supply chain, to reduce costs. Plastic2go uses proven expertise, industry-leading knowledge, innovation and superior products to implement plastic reusable storage and shipping systems. Our Plastic bulk containers (pallet boxes) are a result of many years of continued and extensive research, development and use, offering a cost-effective solution to diverse storage and distribution requirements as well as offering many benefits over traditional materials, such as wood containers or cardboard boxes. To further maximize your reusable packaging investment, Plastic2go provides the expertise and analysis to ensure a cost effective use of our intermediate bulk containers. Our expert team, if requested, will support your purchasing personal in analysing requirements and advise you on most suitable container to your needs. Plastic2go expert team will ensure smooth implementation of reusable packaging and a rapid return on investment. Our Plastic bulk containers (pallet boxes) are basically a big size container with built in pallets to allow easy manoeuvring and cost effective in pallet cost, and time and money associated with the need to move the product from one place to another. Our Plastic bulk containers (pallet boxes) require little or no cost for repair and maintenance, which reduces containers costs per trip by up to 75%, resulting in a faster return on investment. Our Plastic bulk containers (pallet boxes) offer high dimensional stability with variation of loads, from lightweight, through medium-duty up to heavy-duty. Our Plastic bulk containers (pallet boxes) are waterproof. They can handle different types of weather and a wide range of temperatures, from sub freezing temperature to temperatures as high as 85℃, which makes them ideal for food, pharmaceuticals, automated warehouses and or outdoor storage. Our Plastic bulk containers (pallet boxes) are resistant to humidity and therefore are most suitable for storage and transportation of products that must stay dry, like chocolate, coffee, paper products, pharmaceuticals, exotic wooden products, cement, spices, cereal and dry minerals. Our Plastic bulk containers (pallet boxes) are resistant to bacterial contamination under a wide range of operating temperatures. This makes them suitable for food handling, automated warehouses and outdoor storage. Our Plastic bulk containers (pallet boxes) are moulded, which makes their stacking much more efficient inside a warehouse, in a truck or any transportation vehicles. Therefore, it is cost-effective in saving storage space. Our Plastic bulk containers (pallet boxes) weigh 30-50% less than same-dimension wooden intermediate bulk containers. This makes them cost-effective for shipping, airfreight and storage. Our Plastic bulk containers (pallet boxes) have no sharp edges, no nails and no splinters, so they minimise the damage to personnel and goods and are safe and easy to handle. Those qualities found to be effective in enhancing safety in the material handling industry both for workers and for products. Our Plastic bulk containers (pallet boxes) are easy to clean. You can wash them with high pressure or, if needed, sterilize them at temperatures up to 120℃. Our Plastic bulk containers (pallet boxes) are non-absorbent and neutral to odours and tastes. This makes them suitable for pharmaceutical or food applications. This quality makes our Plastic bulk containers (pallet boxes) much more hygienic! Our Plastic bulk containers (pallet boxes) are environmentally friendly. Reusing them reduces the chopping down of trees by replacing wooden intermediate bulk containers or processing of wood into cardboard, thereby decreasing global warming. Our Plastic bulk containers (pallet boxes) are 100% recyclable. When damaged, our Plastic bulk containers (pallet boxes) can be remoulded and save some more trees. Plastic bulk containers (pallet boxes) have significant advantages over their wooden intermediate bulk container counterparts. Plastic bulk containers (pallet boxes) are safer to handle than wooden intermediate bulk containers, due to the design, smooth finishing and lower weight. Plastic bulk containers (pallet boxes) have significantly lower weight than wooden containers. Using Plastic bulk containers (pallet boxes) decreases worker compensation and insurance costs associated with back injuries from lifting. Plastic bulk containers (pallet boxes) have no sharp edges, no nails and no splinters. Using Plastic bulk containers (pallet boxes) lessens insurance costs associated with workers’ injuries and damage to goods. Plastic bulk containers (pallet boxes) are space saving relatively to wooden intermediate bulk containers and therefore decrease shipping and storage costs. Plastic bulk containers (pallet boxes) in contrast to the wooden products can be easily stacked on top of each other even outside in all weather conditions and save storage space. folding unused Plastic bulk containers (pallet boxes) are cheaper to transport -64% to 78% less space and weight. Plastic bulk containers (pallet boxes) are easier to handle than wooden products because of uniformity, variety of design and ease of manoeuvrability. Uniformity of Plastic bulk containers (pallet boxes) on factory assembly lines causes fewer stoppages by size differences. 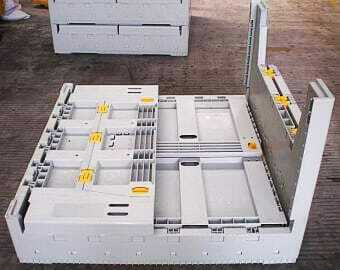 Plastic bulk containers (pallet boxes) are moulded. They are 100% identical to one another in size and allow easy calculation of measurement for shipping and storage. They are also easy to use with robots and assembly lines. Plastic bulk containers (pallet boxes) offer a wider variety of designs than wooden products. There are over 500 kinds of intermediate bulk containers to suit different needs, sizes and load requirements. Plastic bulk containers (pallet boxes) offer easy handling because of the pallets attached to the bottom and allow an easy moving from one place to another. Plastic bulk containers (pallet boxes) lighter than wooden intermediate bulk containers. Therefore, Plastic bulk containers (pallet boxes) have an advantage in weight calculation for shipping. Plastic bulk containers (pallet boxes) are more versatile than wooden intermediate bulk containers. Plastic bulk containers (pallet boxes) can be used in cold and warm conditions from -22℃ to +60℃ with no damage, unlike wooden intermediate bulk containers which are damaged by even mild changes in temperature. Plastic bulk containers (pallet boxes) have a very high UV rate. They can be stored outside in rain, wind and sun, which have little to no damaging effect. Wooden intermediate bulk containers are sensitive to the elements. Plastic bulk containers (pallet boxes) are much more hygienic than wooden intermediate bulk containers. The hygienic properties of Plastic bulk containers (pallet boxes) are extremely important in agriculture, food and pharmaceutical industries. Plastic bulk containers (pallet boxes) are easy to clean with solvents, steam or water, while wooden intermediate bulk containers are damaged in contact with solvents, steam and water. Plastic bulk containers (pallet boxes) can be steam-cleaned with temperatures up to 120℃. Plastic bulk containers (pallet boxes) are not sensitive to bacteria, fungus and insect contamination, unlike wooden intermediate bulk containers. Plastic bulk containers (pallet boxes) do not absorb water and are impervious to acids and fats, while wooden intermediate bulk containers are most sensitive to acids and fats. Due to their strength and design, Plastic bulk containers (pallet boxes) are more durable than wooden intermediate bulk containers. The average Plastic bulk containers (pallet boxes) life ranges from 50 to 500 usages (depending on its type) versus 10 to 50 usages for the wooden products which then need to be repaired. That’s about ten times more durable. Plastic bulk containers (pallet boxes) are much more cost-effective relative to wooden intermediate bulk containers because of their durability. The cost of Plastic bulk containers (pallet boxes) ranges from as low as US$100.00 up to US$560.00 with the average price about US$180. The average cost of a wooden product is about US$40. However, on a per-trip basis Plastic bulk containers (pallet boxes) are by far more cost-effective than wooden intermediate bulk containers. The average cost per trip is about US$0.1 for a plastic intermediate bulk container, compared with an average of US$0.25 per trip for the wooden product. There are other costs associated with continually purchasing wooden intermediate bulk containers and maintaining them as opposed to using Plastic bulk containers (pallet boxes). There are also costs associated with warehousing because of damage to shipped product due to broken wooden intermediate bulk containers or damage caused by nails or splinters. 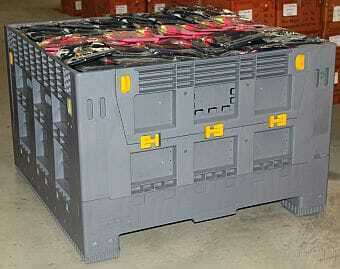 Plastic bulk containers (pallet boxes) are durable and save cost on insurance on returned products. Plastic bulk containers (pallet boxes) are significantly lighter than wooden intermediate bulk containers. Plastic bulk containers (pallet boxes) weigh 2-4 times less than wooden intermediate bulk containers. The lower weight of Plastic bulk containers (pallet boxes) results in savings of shipping costs, especially for air freight. Most Plastic bulk containers (pallet boxes) are fully recyclable. This is very important issue in the time when government around the world enforces strict environmental policies and regulations. In some countries, the use of environmentally friendly Plastic bulk containers (pallet boxes) can result in significant cost savings and attract governmental support and subsidies. 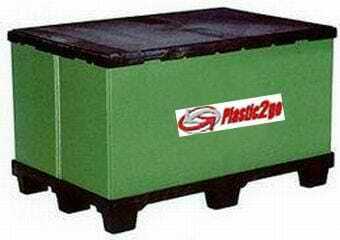 Plastic bulk containers (pallet boxes) made of recycled plastic are available at a lower cost. Plastic bulk containers (pallet boxes) have an advantage because they can be manufactured using several different technologies: standard injection moulding, structural foam injection moulding, blow moulding, rotational moulding, single-sheet vacuum thermoforming and twin-sheet thermoforming. The Injection Moulding process involves forcing a hot mixture of resin into a mould to make a plastic container. Plastic bulk containers (pallet boxes) made by the injection moulding process have many internal features such as channels and ribs to increase the strength of the container and its pallet and reduce its weight. The finished product is a solid plastic intermediate bulk container with pallet that is very rigid and sometimes too fragile for some applications. Injection-moulded have lower impact strength relative to other types of Plastic bulk containers (pallet boxes), particularly at low temperatures. Structural Foam Moulding is similar to conventional injection moulding, except that a foaming agent is introduced with the resin melt and injected into the mould using low pressure. The result is a container, with an integral skin and, a cellular foam core with a high strength-to-weight ratio. 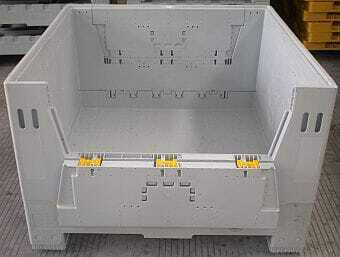 An advantage of structural foam is that it gives the bulk container some flexibility. This process also helps to keep the overall weight and material costs of these Plastic bulk containers (pallet boxes) down. This kind of plastic container is consistent and offers good dimensional stability. It can be manufactured with post-consumer recycled material to reduce the cost. Structural foam plastics have the highest load capacity among different types of Plastic container. They are particularly useful for heavy-duty applications. Blow Moulding process involves injecting air into the mould to blow the plastic out to the sides of the mould. The resulting intermediate bulk container looks like a twin-sheet thermoformed container. Blow moulded Plastic bulk containers (pallet boxes) have lower structural strength than other types of intermediate bulk containers and can be used for light-weight products. Rotational Moulding is a process that uses a large, clamshell-like mould loaded with resin in granular form. The mould spins over a heat source and the centrifugal force pushes the melted resin to the sides of the mould, creating the Plastic bulk containers (pallet boxes) Rotational moulding principal has an advantage because of its lower-cost tooling. However, the process is more time-consuming than others. It is not the process to use for high-volume, specialized requirements. Vacuum Thermoforming process involves a sheet of plastic that is pulled onto a mould via a vacuum process. This is one of the lower-cost methods for making Plastic bulk containers (pallet boxes). Tooling for vacuum forming and twin-sheet thermoforming is less expensive than for injection moulding or structural foam moulding. However, vacuum-formed containers tend to have rather thin walls, offering limited impact strength. Some manufacturers add steel rods within the plastic shell to give the intermediate bulk containers strength. 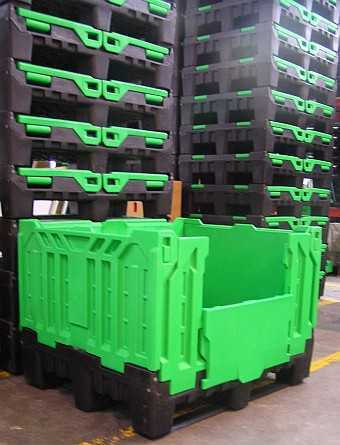 Among all of the types of Plastic bulk containers (pallet boxes) available at the market structural Foam Injection Moulding and Injection Moulding intermediate bulk containers are considered the best for major heavy-duty closed loop applications in food distribution for storage and delivery systems. Plastic bulk containers (pallet boxes) are easier to handle than wooden intermediate bulk containers. Plastic intermediate bulk container have an attached pallet to its bottom therefore saves the need to load the container to a pallet all along the supply chain or to shift the product from one container to the other. Plastic bulk containers (pallet boxes) eliminate the need for fumigation for quarantine purposes that is a time consuming process and costly procedure. Plastic bulk containers (pallet boxes) offer wider variety of designs than wooden intermediate bulk containers. Plastic bulk containers (pallet boxes) are lighter and are safer to handle comparatively to wooden products. Lower weight of Plastic bulk containers (pallet boxes) decreases worker compensation and insurance costs associated with back injuries from lifting containers. Plastic bulk containers (pallet boxes) offer easier handle than containers needs to be loaded by hand. Plastic bulk containers (pallet boxes) are safer for use because of smooth design with no nails or splinters. Plastic containers usage supports a good delivery of product and is cost-effective in insurance to product delivered. Plastic bulk containers (pallet boxes) in contrast to wooden counterparts can be easily stacked on top of each other and save space. 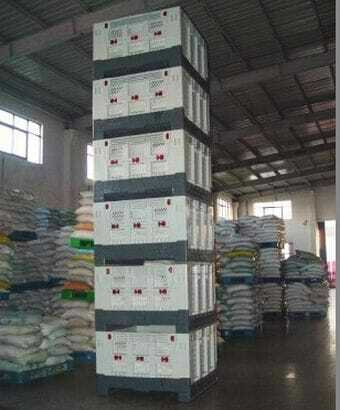 A stack of folded Plastic bulk containers (pallet boxes) will occupy less than fifth the space a similar number of wooden intermediate bulk containers might. Folding makes it easy for distribution centres to have a supply of the intermediate bulk containers on hand ready for shipment. Plastic bulk containers (pallet boxes) can be stored outside with no damage and saves factory space. Plastic bulk containers (pallet boxes) are identical to each other and comply with required specifications for dimensions, weight, and load capacity. This is a very important feature for automated material handling, storage and shipping. Plastic bulk containers (pallet boxes) are easy to clean. Plastic bulk containers (pallet boxes) are much more hygienic than wooden products. They are easy to clean with solvents, steam or water and are not a substrate for bacteria, fungus and insect contamination as is the case for wooden products. Plastic bulk containers (pallet boxes) do not absorb water and are impervious to acids, fats and solvents. Hygienic properties of Plastic bulk containers (pallet boxes) are extremely important in agriculture, food and pharmaceutical industries. 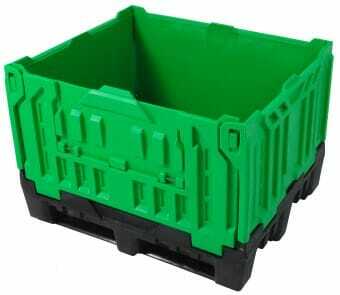 Plastic bulk containers (pallet boxes) are strong and durable. 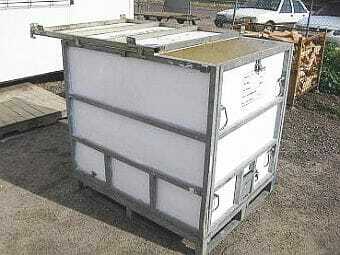 Plastic containers can withstand deep freezing conditions as well as open and extreme sun conditions. Plastic bulk containers (pallet boxes) usage minimise the need for costly wood intermediate bulk containers repairs. Plastic bulk containers (pallet boxes) can not be used for firewood by employees.